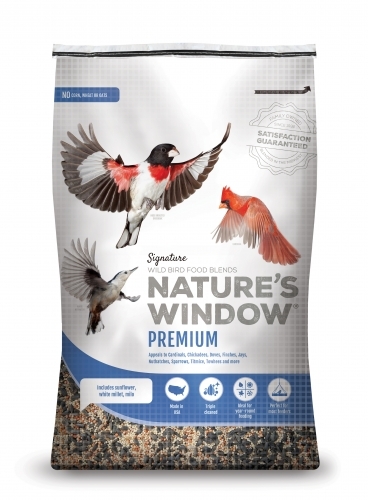 Nature's Window Premium wild bird seed blend. This signature blend has concentrated nutrition for exceptional feeding. Nature's Window Premium wild bird seed blend. This signature blend has concentrated nutrition for exceptional feeding. Premium blend is higher powered with extra nutritious ingredients for healthy birds and the frequent fly-bys you love. Contains: sunflower seeds, white millet, milo.